With less than one week before the largest North America solar trade show, SPI, kicks off in Las Vegas, visitors are being advised to expect to spend their day on their feet. With the two South Halls of the Las Vegas Convention Center being consumed by the exhibition, organizers say that attendees can expect to take many more than 10,000 steps a day. Unique booth designs and companies going “all out” are to be expected at SPI this year, according to organizers with Hanwha Q CELLS taking out the largest booth space. 25% of the exhibitors are from outside of the U.S., with 23 countries being represented. Chinese, Germany and Spanish country pavilions will also occupy large sections of the trade show floor. Of the U.S. exhibitors, Californian companies represent the largest group, making up 31%. The state is followed by Texas, Colorado and Ohio – with each of these states comprising 5% of the total number of exhibitors. The current power trade between the United States and Mexico is relatively small, and the renewable sector in Mexico remains underdeveloped. Yet, encouraging market dynamics gives ample reason to pay attention to this area. California has entered into a partnership with the Canadian province of Quebec to link up their carbon markets. It's a small step, but the two have already created the largest carbon market in North America. Companies have experienced 35 percent savings in their solar panel field project costs through greater efficiencies. SolarCity, the nation's largest residential solar installer and financier, is coupling Tesla's battery-based energy storage hardware with its rooftop solar systems. Peter Rive, the co-founder and CTO of SolarCity, spoke at last week's Energy Storage North America conference and said that the standard offering from SolarCity could eventually include storage. Rive added that the combination of solar and storage "won't look that much different for the customer," but that "the benefit to the customer will be that you will have a little backup power." Defecting from the grid? A recent RMI blog post contends that "continued rapid declines in the cost of solar and the start of the same trend for storage mean that grid parity may come much sooner than previously thought -- and well within the 30-year planned economic life of typical utility investments." When asked about this report on the economics of consumers defecting from the grid, Rive had this to say: "I hope it doesn't happen. I don't think it makes sense for someone to remove themselves from the grid. If you think about the load on a circuit as opposed to an individual home, an average home on a circuit is maybe 3 kilowatts peak. But you may find that any given home will go up to 10 kilowatts at any given time. That means the battery would have to be sized to 10 kilowatts." A proposed “tower power” solar power plant near Joshua Tree National Park that drew heavy opposition from environmental groups has been scrapped. An application to state regulators for the Palen solar power project, a joint venture by Oakland-based BrightSource and the Spanish solar power giant Abengoa Solar, was withdrawn recently. Two 750-foot towers were originally proposed for a nearly 2,000-acre east Riverside County project that would have been near Joshua Tree National Park and the Pacific Flyway, a path migrating birds travel that often includes a rest in the Salton Sea. David Lamfrom, California Desert programs manager for the National Parks Conservation Association, said the project had the potential to be more damaging to wildlife than the 450-foot Ivanpah towers. State regulators recently ordered the project scaled back from two towers to one. “After carefully reviewing the proposed decision recommending approval of one tower, as well as other aspects of the development, we determined it would be in the best interest of all parties to bring forward a project that would better meet the needs of the market and energy consumers,” Joe Desmond, senior vice president of marketing and government affairs at BrightSource, said in a statement. “Airport interest in solar energy is growing rapidly as a way to reduce airport operating costs and to demonstrate commitment to sustainable airport development,” says the website of Harris Miller Miller & Hanson Inc., a consulting firm that helped write the FAA’s regulatory guidance for solar power at airports. Right now, airport operating costs are high, so high that the majority of airports lose money every year. A substantial portion of those costs come from energy use. In fact, the Airport Cooperative Research Program says airports are one of the largest public users of energy in the country. In terms of expenses, energy is often the second largest operating expense, exceeded only by personnel, according to the ACRP. One way to reduce energy costs is simply to reduce electricity use, which is why many airports have taken to installing solar projects. That’s because when the initial cost of the installing the project is paid off, the airport essentially provides free electricity to itself, disregarding the cost of maintenance. That scenario, however, is only possible if the airport decides that it would like to privately own the solar operation — something that does not happen widely in the United States due to the substantial cost involved. What happens far more often is that airport solar projects are owned by private companies, which unlike airports, are eligible for tax credits. The airport, in most cases, acts solely as the property owner. Is it a solar cell? Or a rechargeable battery? Actually, the patent-pending device invented at The Ohio State University is both: the world's first solar battery. In the October 3, 2014 issue of the journal Nature Communications, the researchers report that they've succeeded in combining a battery and a solar cell into one hybrid device. Key to the innovation is a mesh solar panel, which allows air to enter the battery, and a special process for transferring electrons between the solar panel and the battery electrode. Inside the device, light and oxygen enable different parts of the chemical reactions that charge the battery. The university will license the solar battery to industry, where Yiying Wu, professor of chemistry and biochemistry at Ohio State, says it will help tame the costs of renewable energy. "The state of the art is to use a solar panel to capture the light, and then use a cheap battery to store the energy," Wu said. "We've integrated both functions into one device. Any time you can do that, you reduce cost." He and his students believe that their device brings down costs by 25 percent. An 8.6 kWh lithium-ion solar energy storage system for residential and commercial use has been launched by JuiceBox Energy. It is designed to work with grid-tied or off-grid solar systems. 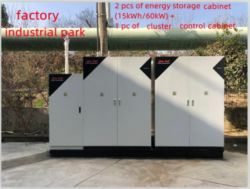 It features a system controller so the battery can be used as back-up power to a grid, thus enabling peak shifting and demand charge reduction. Notice these capabilities go beyond mere storage. In other words, battery technology can be smart and interactive in addition to storing electricity. The system has a battery based inverter, and management system for charging and discharging. Diagnostics are part of the design, too, to monitor the system for potential faults. JuiceBox will be available in the fourth quarter of 2014, with greater volume production beginning in 2015. “Energy storage is the critical technology that allows unrestrained solar growth enabling a clean energy future and a more resilient grid,” explained Neil Maguire, CEO of JuiceBox. JuiceBox is taking advance orders, but it isn’t clear yet what the price is. During the first Obama Administration, Mr. Silver led both the federal government's $50 billion clean energy investment fund and its $20 billion fund focused on electric vehicles. While an electric vehicle may go 200 or 250 miles without a charge a combination of fuel cell and fuel together with a balance of system could travel 500 or even 800 miles depending upon the specific requirements and design.